Leaving the protective environment of art school has always been a huge challenge. In 1972, a group of London graduates, led by Jonathan Harvey and David Panton, took matters into their own hands. The unpromising recession-gripped landscape of East London – of empty factories and riverside warehouses, and boarded-up houses destined for demolition – presented an unexpected route to survival: cheap, though temporary, space to work and live appeared to be in free supply. Acme Housing Association was formed as the legal mechanism to unlock this space, with short-life houses transferred by local government authorities to make use of an otherwise wasted resource. Self-help was key, with artists finding ingenious solutions, given limited means, to create the spaces they needed from the semi-derelict properties at their disposal. From these modest beginnings, Acme offers affordable working and living spaces to thousands of artists, as well as residencies, advisory services and exhibitions. This exhibition tells the story of their first decade. Using remarkable documents and photographs from their archives, the history of the Acme studios and the legendary Acme Gallery in Covent Garden (1976–1981) unfolds. Co-curated by Jonathan Harvey, CEO, Acme Studios, assisted by Research Consultant, Dr Arantxa Echarte. Image Credit: Acme Exhibition Poster © Acme Studios. 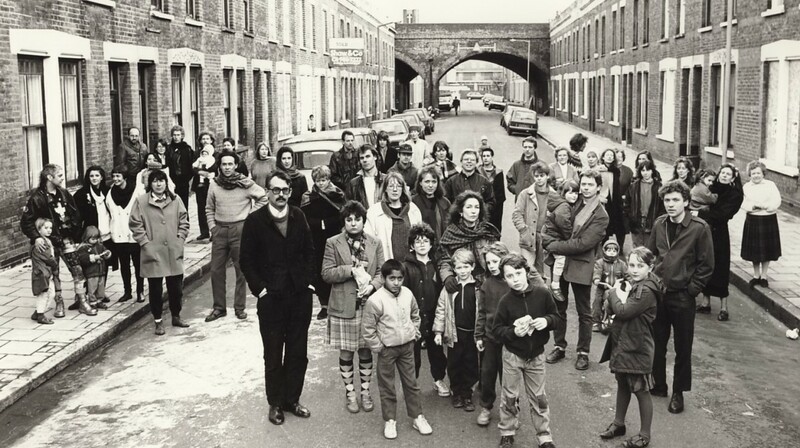 Edward Woodman Artists and their families living on Beck Road, E8, 1988.